First you must make sure two things are true. As the manager, your mail must be delivered to your mailbox on the Exchange server, not to an Outlook Data File (.pst) on your computer. This means your email account needs to be Exchange. You and your delegate must use the same version of Outlook. Reviewer: With this permission, the delegate can read items in the manager's folder. Author: With this permission, the delegate can read and create items, and change and delete items that he or she creates. For example, a delegate can create task requests and meeting requests directly in the manager's Task or Calendar folder and then send the item on the manager's behalf. Editor: With this permission, the delegate can do everything that an Author has permission to do and additionally can change and delete the items that the manager created. 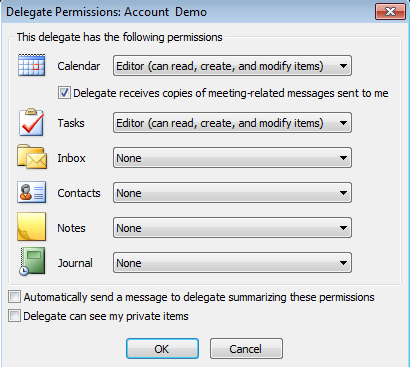 A delegate automatically receives Send on Behalf permissions. By default, the delegate can read only the meeting requests and responses sent to the manager. The delegate does not have access to read any other messages in your Inbox. Click Add and then click Ok. In the Delegate Permissions dialog box, you can accept the default permission settings or select custom access levels for Exchange folders. If a delegate needs permission to work only with meeting requests and responses, the default permission settings, including Delegate receives copies of meeting-related messages sent to me, are sufficient. You can leave the Inbox permission setting at None. Meeting requests and responses will go directly to the delegate's Inbox. By default, the delegate is granted Editor (can read, create, and modify items) permission to your Calendar folder. When the delegate responds to a meeting on your behalf, it is automatically added to your Calendar folder. Messages sent with Send on Behalf permissions include both the delegate's and manager's names next to From. When a message is sent with Send As permissions, only the manager's name appears. If you want to remove all Delegate Access permissions, do not click Permissions but instead click Remove and skip the remainder of these steps. To send a message to notify the delegate of the changed permissions, select the Automatically send a message to delegate summarizing these permissions checkbox. 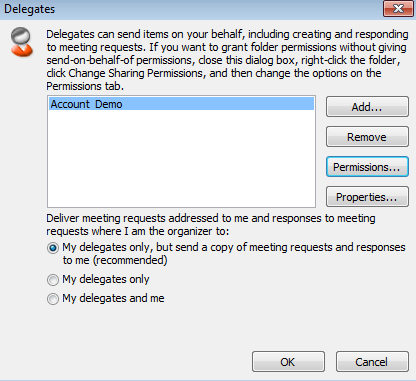 If you want copies of meeting requests and responses that you receive to be sent to a delegate, make sure the delegate is assigned Editor (can read, create, and modify items) permission to your Calendar folder, and then select the Delegate receives copies of meeting-related messages sent to me check box. 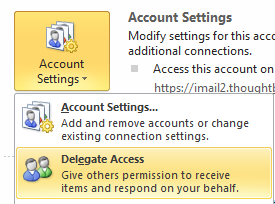 If you have assigned permissions to a delegate so that he or she can access your Outlook folders, you can hide personal information in appointments, meetings, tasks, and contacts. Open each personal item, and on the Calendar Tools tab, in the Tags group, click Private. 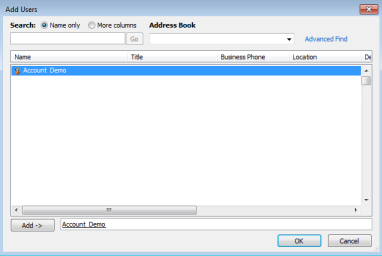 Select the Delegate can see my private item checkbox. IMPORTANT You should not rely on the Private feature to prevent other people from accessing the details of your appointments, contacts, or tasks. To make sure that other people cannot read the items that you marked as private, do not grant them Reviewer (can read items) permission to your Calendar, Contacts, or Tasks folder.